Orange County is proud to be ranked No. 16 in the Top 100 Companies for working families. The Orlando Sentinel’s Top 100 Companies for Working Families designation recognizes Central Florida’s top companies for their commitment to family and work life balance. Orange County has 6,547 full-time employees and 930 part-time employees ranging from correctional officers to chemists serving approximately 1.2 million residents. “Orange County strives for a workplace culture that builds camaraderie and an environment where coworkers feel that they are part of a family while at work,” said Director of Human Resources Ricardo Daye. Orange County employees are focused on changing lives for the better throughout our community. This year represents the 16th annual United Way Employee Giving campaign. Orange County has grown to be the 5th largest donor to the Heart of Florida United Way, with employees donating an astonishing $2.7 million dollars over the past five years — an average of $450,000 per year. In keeping with Orange County’s Neighbors Helping Neighbors philosophy, an employee driven annual Holiday Heroes Toy Drive brings smiles to the faces of children in Orange County who may not have a single present to open during the holiday season. Since its inception in 2011, an estimated 12,155 toys have been distributed through this initiative. 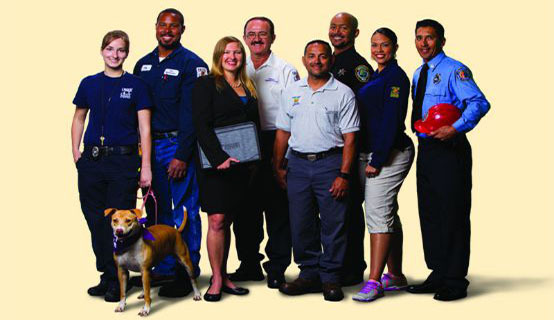 As an employer, Orange County is committed to supporting the health and quality of life of all employees. The County provides all regular employees and their eligible dependents the opportunity to participate in a group insurance plan that includes medical, dental and vision, as well as long-term disability, life and dependent life insurance. Employee health and welfare benefits are a way Orange County puts this commitment into action. In addition, full-time and part-time employees are encouraged to continue their formal academic education in areas that will enhance their contribution to County service, and they are eligible for tuition reimbursement. One of Orange County’s top priorities is employee wellness. The Wellness for Life program is designed to support employees and their families as they adopt and sustain behaviors that reduce health risks, enhance personal effectiveness, improve quality of life and ultimately benefit the organization’s overall productivity. Some of the program’s initiatives include access to an onsite nurse, mobile mammography, health fairs, 5Ks, flu shot clinics, interactive seminars, a diabetes prevention program, free gym membership and more. Orange County truly is the best place to live, work, learn and raise a family. Citizens interested in joining the Orange County may apply for jobs online at www.OCFL.net/jobs.